Quantum Geothermal has participated in the design and construction over 50 new custom homes in the west GTA area. In the last few years new home construction has become our primary focus and now accounts for the majority of our installation projects. Working with various designers and builders we have accumulated a valuable inventory of protocols and procedures that can add value and reduce inefficiencies in the construction costs of a project. Upon request, will be pleased to discuss specific protocols that might be of benefit to you as you proceed with the planning, design and construction of your new home. For example, here is one useful protocol to consider. It is recommended that the installation of the ground loop be completed early in the construction cycle. Working in cooperation with the client and builder an assessment of the site plan will determine the preferred configuration and location for the ground loop. The protocol is to position the septic system as the first priority on the site. The geothermal ground loop can then be positioned within the remaining area of the site. 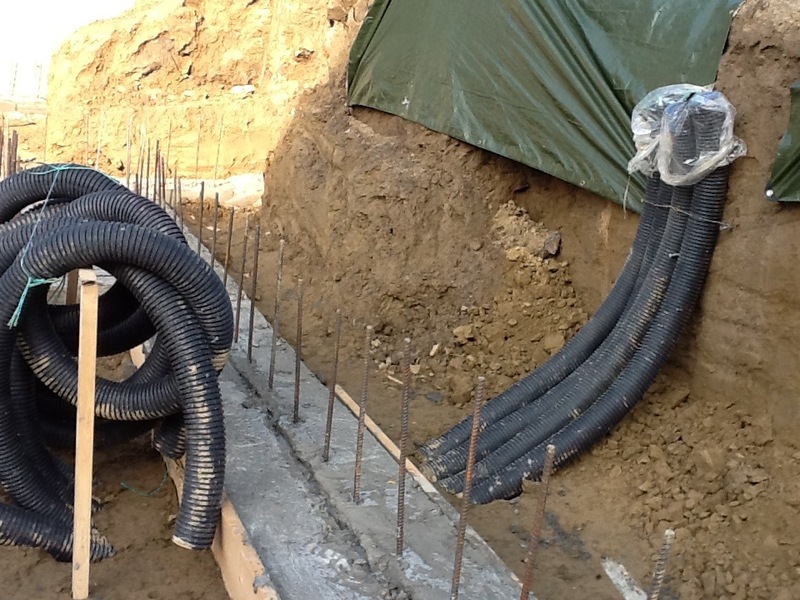 A system of 3/4” HDPE piping will be positioned (horizontally or vertically) and then one or more manifold(s) will be fabricated to join the ground loop to the supply and return lines which will be brought into the basement of the home once the foundation walls are poured. There is a preferred protocol for this step in the construction process. An appropriate number of 4” OD, corrugated, non-perforated plastic pipes (aka “Big Os”) should be installed running from outside the foundation wall to the utility room to act as a conduit for the supply and return lines between the ground loop and the heat pump(s). As shown in this photo, these Big O tubes should be laid under the footings when the foundation wall is poured. Using this technique eliminates the need to core through the foundation wall at a later date to bring the supply and return lines into the basement utility room area. This provides a cost savings and eliminates the need for pipe to run through the joist space of the newly constructed basement to reach the utility rooms. The conduits are laid in the gravel subfloor and then positioned within the utility room prior to the pouring of the basement concrete slab. Once the ground loop is completed and the pipes are brought into the appropriate area of the home the outdoor phase of the construction of the geothermal heating and cooling system is complete. Please take a few minutes to complete our new home evaluation form and will be pleased to reply with more useful information.